Supported operating systems: Microsoft Windows 10, 8.x, 7, Vista SP2, Server 2012, Server 2008. Embedded versions of Windows are not supported. 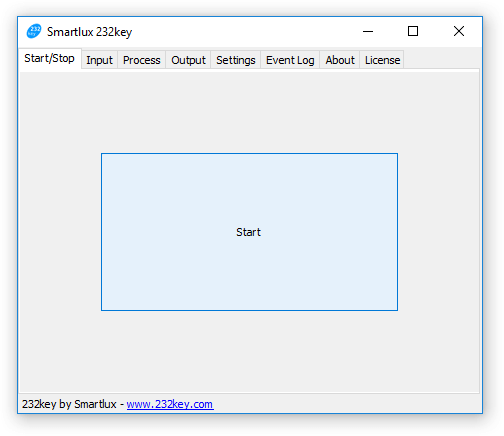 To install 232key, simply download the installer, run it and follow the instructions on your screen. 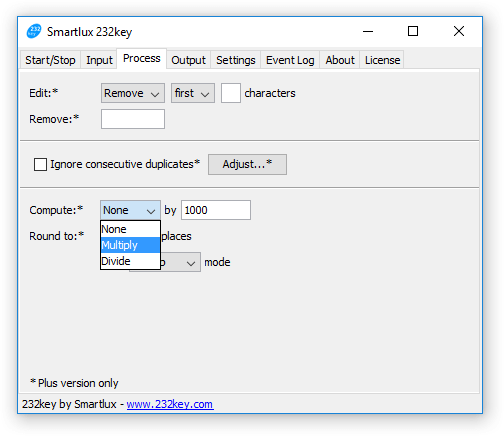 Before starting 232key, please make sure that your serial device is switched on and connected to your PC! Measuring instruments and other devices sending a number: Select this type if your goal is to capture a measurement value from your device (e.g. the weight from a scale). Almost all devices in the list belong to this type. Devices sending text: Select this type if you want to capture a text string in its entirety (e.g. a barcode). Text devices appear in italics in the device list. Currently, the name of all devices of this type starts with " Barcode". If your device is present in the drop-down list, select it and press ⇓ set defaults ⇓ to set the default interface parameters and terminator. If it is not present, select "Generic measuring instrument" to capture numbers or one of the "Barcode" devices to capture text, then proceed to the next step. A&D EM ("emerging markets") scales ("auto-print" mode only). Adam CBK/GBK/GFK scales (set to "C8 LAb oFF", for older scales without this setting please use "Adam label format"). Adam CPWplus scales (mode "trn 3"). Adam Highland (HCB) balances (RS-232 and USB), output format 2 only ("FOr 2"). Ohaus scales and balances (works with Defender 3000 series, new Navigator STX in "numeric value only" mode and many other scales and balances from Ohaus). Ohaus Scout Pro, Traveller and Navigator scales. * supports automatic port detection. *** requires a Plus license. Jadever SNUG II-150 precision balance (can only send data continuously). 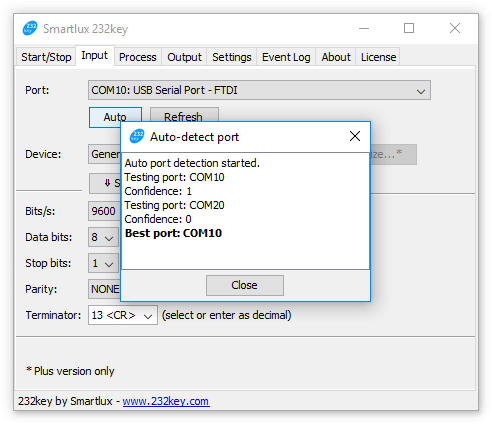 If your device is not included in the device list or if you're not using its default settings, you have to manually set the interface parameters (bits/s, data bits, stop bits, parity) and the terminator character which marks the end of each line of data. Please consult the instruction manual of your serial device to find the appropriate settings. If the number of stop bits is not specified, select "1". The terminator is the very last character in each line of data sent by your device. You can select one of the pre-defined values or enter any ASCII code as a decimal value. The very last character is "line feed" (ASCII code 10), therefore choose "<10> LF" as the terminator in 232key. 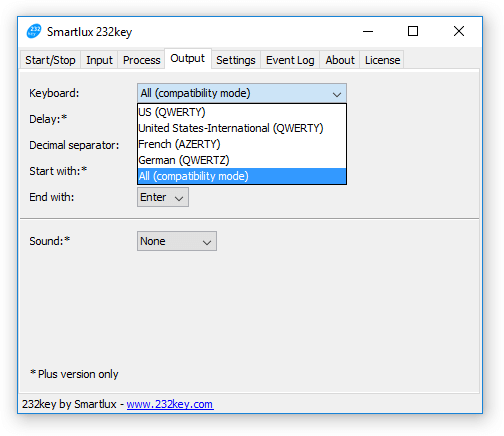 We'd appreciate if you could post the name of your device and your settings in our support forum so that we can add a new device profile to 232key. Thank you! 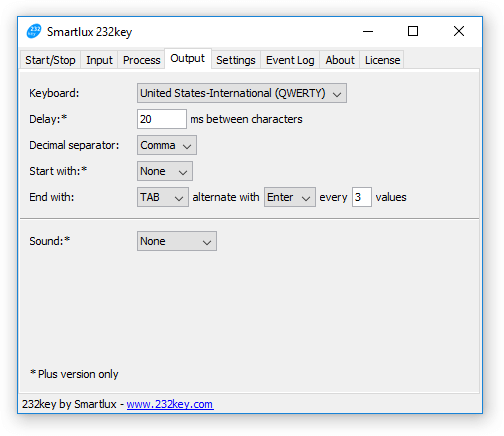 This only concerns 232key's simulated keystrokes. The decimal separator of the numbers sent from your device is automatically recognized. This setting is only available for "number" devices (and disabled for " text" devices). 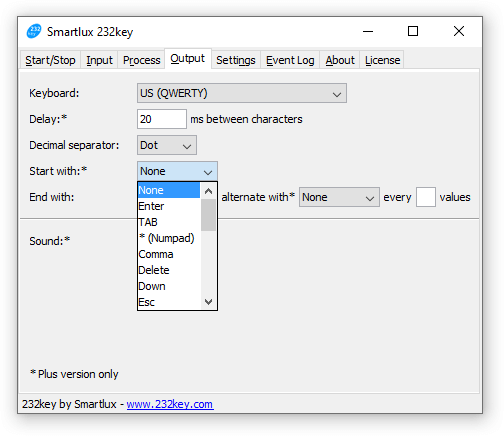 As you can see from the disabled settings in the screenshots, many additional features are available in the Plus version of 232key. Press the start button and switch to the target program (e.g. a spreadsheet software). 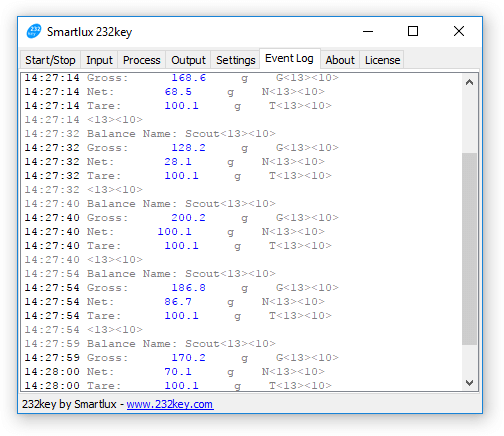 Place the cursor where you want the data to be typed. Press the data transmission button on your device (often labeled "data" or "print") and watch as the value is typed into the target program. 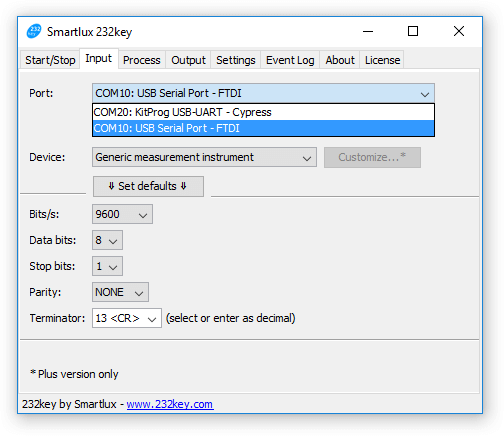 Please consult our extensive troubleshooting page if 232key does not work as expected. You must include an unnamed capture group in your expression (in parentheses). 232key will try to match the entire expression, but will only capture the data within the first capture group. Please select an appropriate device as your starting point: Most devices are meant to work with numerical values! Only the " Barcode alphanumeric" and "Barcode alphanumeric extended" devices can actually type a limited set of non-numerical characters. 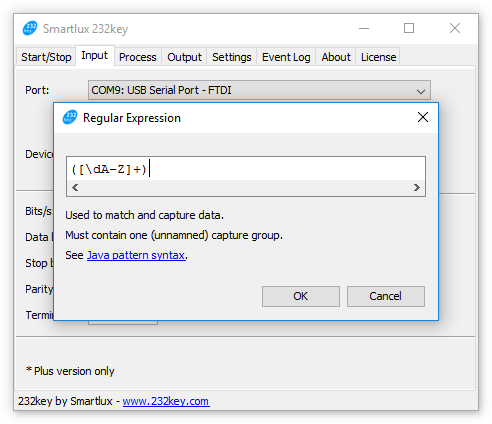 232key uses the Java pattern syntax. If the data captured from your device contains a fixed number of unwanted characters at the beginning or end, you can remove them by using the edit function. You can either specify the number of characters you want to remove or the number of characters you want to keep. If no value is entered, the edit function is disabled. This function works only on the captured characters (highlighted in blue in the event log tab), not on the entire line of characters sent form your device. To change which characters are captured, modify the regular expression. All instances of the characters you enter here will be removed from the captured data. This is very useful for class I and class II balances with an auxiliary indicating device (differentiated digits). When entering multiple characters, each single character will be removed. This can be very useful to prevent user mistakes like scanned a barcode twice. 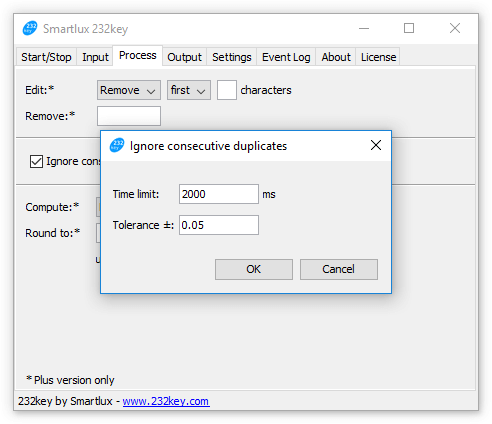 This setting restricts the ignore function: If you enter a value (in milliseconds), the ignore function will check how much time has passed since the last data was captured. If the time limit is exceeded, the newly received data is always typed (even if it is a duplicate). In the example above, data received more than 2000 ms (2 seconds) after the last data was captured will always be typed. xprev - r ≤ xcurr ≤ xprev + r.
x prev: Previous captured value. x prev: Current captured value (becomes new x prev for next comparison, even if it is ignored and therefore not typed). r: Positive value entered in the tolerance ± field (0.05 in the example shown above). The tolerance setting was originally designed to be used with the "auto-print" functionality of some scales which do not require the weight to return to zero before automatically sending it again. When using these scales, you may encounter the problem that the weight fluctuates between two values and is transmitted every time this happens (even though the same object is still being weighed). By setting the tolerance to one display division, these unwanted values will be ignored by 232key. We recommend also setting a time limit so that you can still weigh two objects in a row which happen to have the same weight. It was not designed to be used with devices which send data continuously! 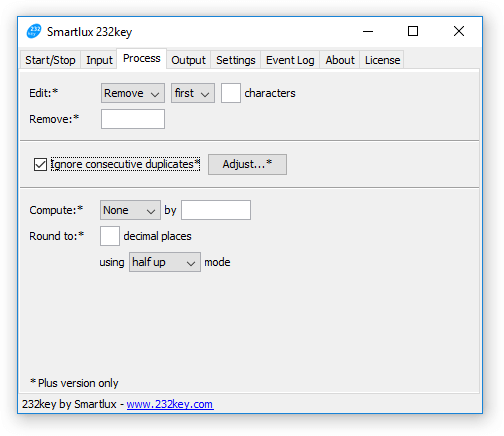 You can apply mathematical operations to values captured by 232key before they are typed into another program. This can be useful for unit conversions. Factors do not have to be integers. Divisors do not have to be integers. Rounding options have to be specified for division (see below). Mathematical operations have no effect if you've selected a " text" device in the input tab (e.g. "Barcode numeric (0-9)"). Rounding allows you to change the number of decimal places of the values which 232key types into your target application. Enter the number of decimal places in the field (0 to 7), leave empty to disable rounding. If the original values have fewer decimal places than the number you entered, they'll not be padded (since version 1.08). This also means that integers will not be padded. Rounding is disabled if you've selected a " text" device in the input tab (e.g. "Barcode numeric (0-9)"). Your device has to send each value in a separate line as shown in the event log below. 232key does currently not support capturing multiple values from a single line. 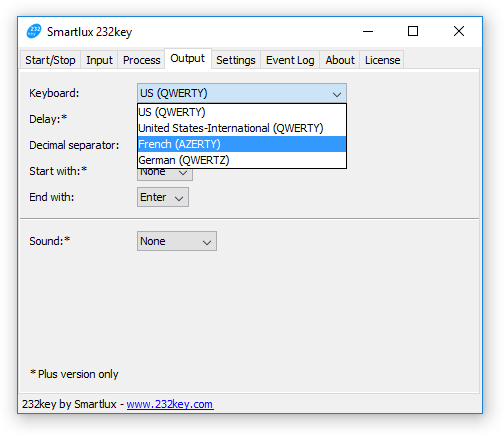 This feature is particularly useful if the serial device you're using doesn't make any sound itself when transferring data (or a device which always makes a sound as soon as the "data" key is pressed, even when no data is actually sent). 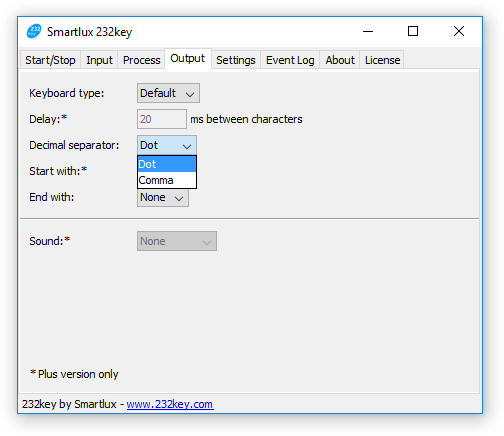 Instead of pressing the start button in the start/stop tab, 232key Plus allows you to select the auto-start option in the settings tab. 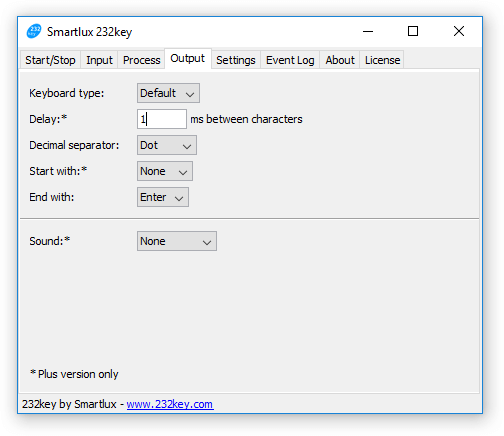 232key will then automatically connect to your device and start the keyboard simulation when you run the program. 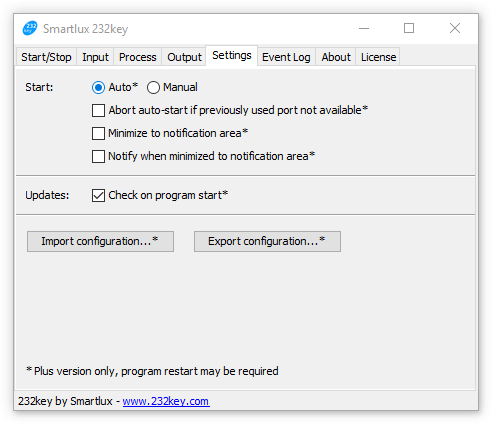 You can also instruct 232key to abort auto-start if the previously used port is not longer available, minimize to the notification area (often called "system tray"), display a notification after being minimized (see image below) and to skip the update check by checking or unchecking the corresponding boxes. 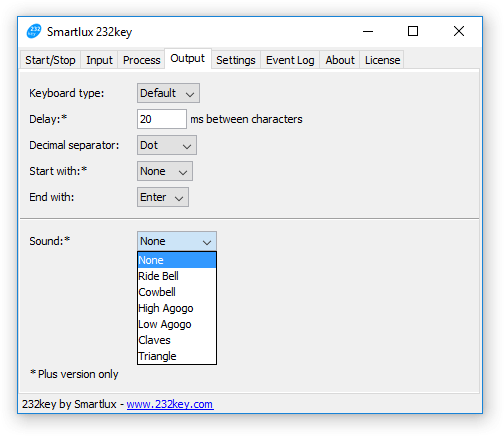 These settings will come into effect the next time you run 232key (restart required). 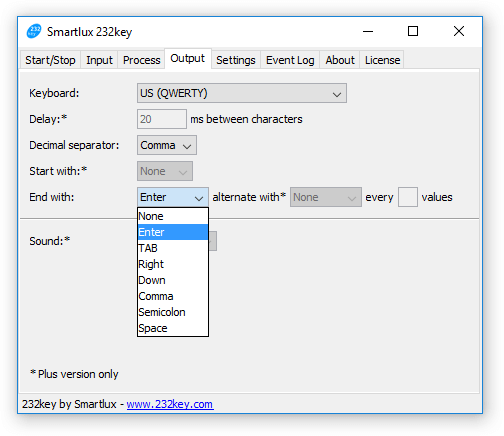 If you want 232key to run automatically when Windows starts, you'll have to place a shortcut in the "startup" folder. See this article for further information. 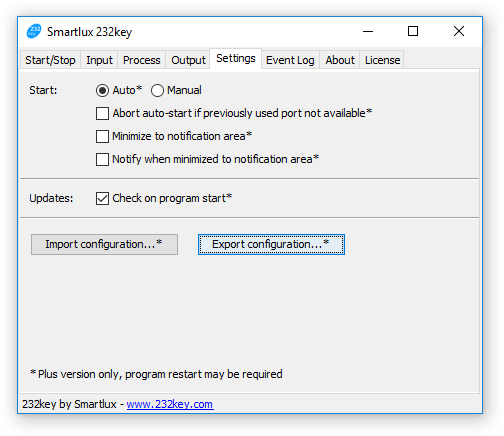 The license key is not exported and cannot be imported. The program has to be restarted after importing the configuration.